LMS Chairman: Well done to the Chartres pilgrims! Today they are coming home. 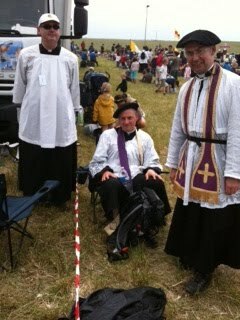 Well done to everyone who did the pilgrimage, and particularly the heroic priests - here's a photo by Fr Bede Rowe of some of his fellow English chaplains. Fr Rowe has been doing a little running commentary from his IPhone (as I did last year); there are more photos on the New Liturgical Movement.